Most people could not name five of the more than 300 alternative cancer treatments. Fewer still could name the five most potent alternative cancer treatments for advanced cancer patients. In fact, the average person knows almost nothing about either orthodox cancer treatments or alternative cancer treatments, outside of what they have heard on television or read in the media. If a survey were taken, the average person would probably think that the true cure rate of orthodox cancer treatments was 40 % or more and the true cure rate for alternative cancer treatments was close to zero percent. This is total nonsense, but more will be said about that later in this article. Is what you know about cancer treatments based on who has the most truth, or is it based on who has the most money ? Is what you know about cancer treatments carefully designed to deceive you ? Are you being sold a "bill of goods ?" This website is just as important for people who don't have cancer as it is for people who do have cancer. Why would someone who doesn't have cancer be concerned about the truth ? The reason is that if they are diagnosed with cancer, their doctor will immediately put intense pressure on them to commit to chemotherapy, radiation and surgery. Unless you know whether alternative cancer treatments or orthodox cancer treatments are superior, BEFORE YOU ARE DIAGNOSED, there is a 100 % chance you will make the wrong decision. If you read all three parts of this article, you are assured of hearing many things that have never entered your mind before. You will read things that you will never, never hear on television or read in print. You will learn a lot about the techniques of deception that you are exposed to every day. You will learn things that the people of orthodox medicine don't want you to know. And all this information is free. Nothing is sold from this website. To visualize what is going on in the "cancer industry" today, and to see behind their massive facade, here is a short story that will describe how orthodox medicine currently treats cancer patients. Suppose you own a nice, comfortable, $300,000 house in the country, near a small city. While you have gone to the store your house catches on fire. As you return home you see that two rooms of your house are in flames and the fire is spreading. You immediately call the fire department. Twenty minutes later three fire trucks show up. The men and women in the first fire truck pull out heavy suits and axes and run to the house and start cutting down parts of the house that have already burned, but are still smoldering. They furiously cut and cut and when they have cut out about 10% of the parts of the house that have already burned, they quit and go back to their fire truck. You note that they did absolutely nothing to stop the spreading of the fire. What they cut out wasn't even burning and it certainly had nothing to do with stopping the raging fire. You watch the men and women in the second fire truck pull out a fire hose and start spraying a powder on the fire. The amount of powder they were spraying did not seem to you to be enough to put out the fire. But you notice that while the powder is slowing down the spreading of the fire, it is also severely damaging the parts of the house that are not on fire. Puzzled, you ask the fireman what the powder is. They say it is a very toxic acid that is capable of putting the fire out, but they can't spray very much of it on the fire because if they did, the entire house would be reduced to a pile of rubble by the acid. Thus, all they can do is slow down the spreading of the fire, but they can't stop the spreading of the fire. Even more puzzled, you ask them why they did not bring water in their fire truck. They said that in firefighter school they were taught that water was useless in putting out house fires. They said that using water on a house fire is an old "wives tale" and water is not effective. They also said that the state firefighter's union would fire any firefighter that used water on a house fire. By sheer coincidence you are also aware that the federal regulatory agency, the Fire Development Administration (FDA), has researched water and has declared that water is an "unproven" method to put out house fires. The FDA says there is "insufficient evidence" as to water's effectiveness and safety. You silently mumble to yourself that there must be a huge connection between the FDA, the firefighter's union, the firefighter schools and the chemical companies. While you have been talking to the men and women in the second truck, five men have jumped out of the third fire truck. They ask you where the couch is in the living room. You point in the general direction of the couch in the living room, which you assume by now is on fire. Each of them immediately pulls out a 30-06 caliber rifle and starts shooting at the couch from where they are standing next to their fire truck. You scream at them and ask them what they are doing. They respond that they have been taught in firefighter's school that couches are very bad to have in a house during a fire, so they are trying to shoot the couch to pieces. They comment: "We think we are doing some good." You say that even if the couch is helping spread the fire, that they are blowing holes in the front and back of the house trying to shoot the couch to pieces from outside the house. Furthermore, very impatiently, you say the fire has already spread far beyond where the couch is located. While the spreading of the house fire did slow down because of the toxic acids, within two hours you no longer have a house. The fire men and women were quite proud that they slowed down the fire. They tell you that your house lasted an extra hour because of their work. You doubt the accuracy of that number. They give each other "high fives," get in their fire trucks, and head back to the fire station. Between the fire, the acid and the bullets, your house has been reduced to rubble. The cutting out of the wood that had already burned, by the first fire truck, had absolutely no affect on stopping the fire. In fact, nothing any of them did stopped the spreading of the fire, it only slowed it down. You are astonished at what you have seen. You ponder why the "investigative journalists" have not jumped on this situation. Then you realize how much money the chemical companies spend on television advertisements and you realize why the "investigative journalists" have kept their mouths shut. A week later, as you drive by the fire department, you notice that all of the cars in the parking lot are very expensive cars. A month later you know why they are driving very expensive cars. They have sent you a bill for their services: $100,000. But they note in the bill that the house insurance company will pay most of the bill. You are amazed when you look at your house insurance policy and realize the insurance company will not pay the bill if the fire department uses water. You ponder to yourself : "What is the connection between the fire department, the firefighter's union, the firefighter's school, the FDA, the insurance companies, the television stations and the chemical companies ?" One thing is clear to you, you now know why all of your friends think the firefighters are heroes, the television stations constantly portray them as heros in their shows. As you research all of the connections between these organizations it quickly becomes clear to you that all of them are owned or controlled by very wealthy people who are very, very good friends with each other. You have a brand new comprehension of what quid pro quo means - you scratch my back and I'll scratch your back. You conclude that a quid pro quo of this magnitude is another term for "conspiracy." What has just been described is how "modern medicine" treats cancer that has already metastasized. Cancer can be compared to a fire. It is a fire that will spread until it kills you. But "modern medicine" does nothing that will put out the fire. The first fire truck represents surgery to cut out tumors or parts of the body where there are concentrations of cancer cells, after the cancer has already started to spread throughout the body ! The third fire truck represents radiation, which is used to shrink tumors, after the cancer has already started to spread throughout the body ! While the second fire truck represents chemotherapy, the "progress" chemotherapy is making is frequently judged by its ability to shrink tumors. Oncologists love to tell the cancer patient that their tumors are shrinking. But even if chemotherapy does slow down the progress of the cancer, and even if it puts cancer patients into remission, it is almost always a temporary Pyrrhic victory because the cancer almost always returns. The Food and Drug Administration (the real FDA) has approved scores of chemotherapy drugs, but none of them can stop the spread of cancer because chemotherapy drugs do not target cancer cells. There are scores of natural substances that do target cancer cells and can stop the spread of cancer. But the FDA has never approved a single one of these natural substances (natural substances cannot be patented by the pharmaceutical companies). Insurance companies will not pay for natural cancer treatments (i.e. alternative cancer treatments). The media never says anything good about alternative cancer treatments, but constantly glorifies the medical profession. Medical schools have not taught a single truthful thing about alternative cancer treatments in over 90 years. "When a patient is found to have a tumor, the only thing the doctor discusses with that patient is what he intends to do about the tumor. If a patient with a tumor is receiving radiation or chemotherapy, the only question that is asked is, "How is the tumor doing?" No one ever asks how the patient is doing. In my medical training, I remember well seeing patients who were getting radiation and/or chemotherapy. The tumor would get smaller and smaller, but the patient would be getting sicker and sicker. At autopsy we would hear, "Isn't that marvelous! The tumor is gone!" Yes, it was, but so was the patient. How many millions of times are we going to have to repeat these scenarios before we realize that we are treating the wrong thing ? In primary cancer, with only a few exceptions, the tumor is neither health-endangering nor life-threatening. I am going to repeat that statement. In primary cancer, with few exceptions, the tumor is neither health-endangering nor life-threatening. What is health-endangering and life-threatening is the spread of that disease through the rest of the body. There is nothing in surgery that will prevent the spread of cancer. There is nothing in radiation that will prevent the spread of the disease. There is nothing in chemotherapy that will prevent the spread of the disease. How do we know ? Just look at the statistics! There is a statistic known as "survival time." Survival time is defined as that interval of time between when the diagnosis of cancer is first made in a given patient and when that patient dies from his disease. In the past fifty years, tremendous progress has been made in the early diagnosis of cancer. In that period of time, tremendous progress had been made in the surgical ability to remove tumors. Tremendous progress has been made in the use of radiation and chemotherapy in their ability to shrink or destroy tumors. But, the survival time of the cancer patient today is no greater than it was fifty years ago. What does this mean? It obviously means that we are treating the wrong thing !" In other words, if the cancer has not spread from the tumor, the tumor presents no danger to the patient (with rare exceptions, such as when a tumor blocks the fluid in the common bile duct). It is important to understand that the vast majority of cells in a tumor are healthy cells. Cancer cells CANNOT form tissue. Thus, if the cancer were contained within the tumor, there would not be enough cancer cells in the person's body to endanger their life. Likewise, if a man had prostate cancer, and the cancer was contained inside the prostate gland, there could not be enough cancer cells inside the prostate gland to endanger the patient's life. Even if the cancer cells in a tumor were killed, or the tumor was cut out, it would not solve the problem of the spreading of the cancer if the cancer has already spread. There would be no benefit to the patient because it is the spreading of the cancer that kills cancer patients, not the cancer inside the tumor. Yet the focus of orthodox medicine is on shrinking the tumors. Chemotherapy (i.e. the second fire truck in the example) is so toxic to cancer patients that if they gave enough of it to a cancer patient to kill all of the cancer cells, the patient would die from the side-effects of the chemotherapy immediately. So doctors give chemotherapy in very low doses (though they seem like very high doses), not enough to actually cure you. In the mean time the cancer continues to spread. Chemotherapy may put a patient "in remission", but virtually every cancer patient who goes into remission eventually comes out of remission and later dies. Incredibly, doctors use radiation, the third fire truck, even after the cancer has started to spread. They are interested in shrinking a tumor. As mentioned above, the tumor is not the problem, it is the spreading of the cancer that is the problem. While orthodox medicine continues to use worthless treatments, that only temporarily slow down the spreading of the cancer, many cancer patients who use alternative cancer treatments fare no better. Many alternative medicine practitioners do not use the best cancer treatments. Either they have been trained to use the most profitable treatments, or they are simply interested in making as much money as possible as fast as possible. To make matters worse, vendors of natural supplements generally only sell their products, thus if they have a very weak product line, the patient probably isn't going to survive. When a person gets cancer, their chances of survival are virtually nil. If they go with orthodox medicine they are assured they will get the treatments discussed above. But even if they go with alternative medicine they are likely to get treatments that simply don't work. This leaves the cancer patient in a quandary. No matter which way they turn the only thing that is thriving is their cancer and their practitioners. But believe it or not, there is good news! While the pharmaceutical industry is in it for the money, Mother Nature isn't in it for money. And Mother Nature is a lot smarter than the chemists in the pharmaceutical industry. And there are some people in alternative medicine who are not getting rich treating cancer patients and they know how to cure the vast majority of cancer cases. And there are even a few vendors who have products that are strong enough for almost all cancer cases! The issue of treating cancer has far more to do with integrity than it does with science. In fact, after several years of researching this very issue, it is clear to this author that treating cancer today has absolutely nothing to do with science. Nothing at all. It is a fact that if every person who has lived on the Earth lived the Golden Rule, as it should be lived, cancer, and hundreds of other diseases, would currently be a footnote in history books. Had the medical community had any integrity, they would have quickly replicated his study, come to the same conclusion (because they did exactly what he did), and would have quickly started giving every cancer patient, terminal or otherwise, 10 grams of Vitamin C by I.V. every day. It appears that extending the life expectancy of terminal cancer patients six-fold, using natural substances, is not important to orthodox medicine. But this is just one of many, many instances where highly effective cancer treatments have been persecuted and/or ignored. There are more than 300 alternative cancer treatments that use natural substances, such as Vitamin C. Every one of them is more effective than the Pauling/Cameron protocol. Every one of them is far more effective than chemotherapy and/or radiation. Every one of them is ignored and many of them have been persecuted. But there is a clear reason why natural substances are ignored. It has nothing to do with their effectiveness. The pharmaceutical industry cannot patent and control, and thus cannot profit from, natural substances. They can only charge their monopolistic prices on synthetic molecules, many of which are nothing but mutations of natural molecules. What is Going On In The Cancer Industry ? Now let's be logical. Suppose a cure for cancer was found; and suppose a treatment to avoid 90% of all heart disease problems was found; and suppose a cure for type 2 diabetes was found; and suppose a cure for AIDS/HIV was found. (In fact, all of these have been found.) Would health spending ever hit 20% of GDP ? Of course not. All of these are highly profitable diseases for both the pharmaceutical industry and the medical industry (and the politicians who claim to represent their constituents). All the money being rasied for treating AIDS patients in Africa are benefiting no one but the pharmaceutical industry stockholders because a cure for AIDS/HIV has been around since 1990. Here is yet another safe prediction : the media will continue to suppress alternative treatments for cancer, heart disease, dementia, diabetes, etc. Ask yourself this questions : "When was the last time orthodox medicine used their massive profits to find a cure for any disease ?" When was the last time a cure for disease was found that used prescription drugs ? If you said polio, you would be wrong. Polio was cured by a medical doctor in the 1940s, but the cure was suppressed because he used a form of Vitamin C, which drug companies could not patent and control. Have you ever wondered what would happen if someone found a cure for cancer ? You probably think that the person finding the cure would be featured on every television show in America and would win a Nobel Prize in medicine. Kaali and Lyman, mentioned above, found a cure for AIDS / HIV, and more than 200 other diseases, and they didn't win a Nobel Prize. Have you ever heard of them before ? It is difficult, if not impossible, to convince the average American that orthodox medicine today is not only corrupt, it is more corrupt than it has ever been in the history of medicine. That is saying a lot because orthodox medicine was persecuting cures for disease in the 1700s. With Big Money comes Big Corruption. The bigger the money the more the corruption. Unfortunately, there are some in alternative medicine who are also more interested in profits than their patients. The main difference between orthodox medicine and alternative medicine is freedom. The people with integrity in alternative medicine are allowed a great deal of freedom to help others. However, the Food and Drug Administration is always looking for excuses to crush the people who know how to cure diseases which are highly profitable to Big Pharma and Big Medicine (and thus Big Government). Nevertheless, in spite of some persecution, there are over 300 alternative cancer treatments that currently exist. Every one of them can cure some cases of cancer, if the person starts using that treatment immediately after being diagnosed. However, there is a very wide range in effectiveness between these treatments, especially when used on advanced cancer patients. The problem with alternative medicine is that patients are frequently on their own to find out which treatments work for their situation - and which don't work. Unlike orthodox medicine, which is very uniform across the country, alternative medicine is neither organized, nor uniform. The quest for truth is always a winding and rocky road, especially when money is involved. Some people erroneously think that medical doctors do not use the best alternative cancer treatments because the doctors do not know which treatments are really effective. While medical schools turn doctors into nothing but drug salesmen, that is not why medical doctors do not use natural substances in the treatment of disease. Medical doctors know how to read. But they also know that if they used a single one of these alternative cancer treatments on a single cancer patient, they would risk losing their license and could go to jail ! While it is this attitude that creates uniformity in orthodox medicine, it is also this attitude that crushes progress. Orthodox medicine is a highly controlled monopoly, totally controlled by the combination of Big Pharma and the American Medical Association. The suppression of truth by Big Medicine is why this website, and many other websites, exist. The major purpose of this website is to make information about alternative cancer treatments free and available to the public so that more and more people know which alternative cancer treatments are the strongest. All of your life you have probably been taught that natural substances from Mother Nature cannot possibly be as effective against cancer as the highly condensed, highly potent synthetic molecules made by the drug companies. In other words, you have been taught that chemotherapy drugs kill cancer cells far better than anything Mother Nature can put together. That is definitely not a true statement, but even if it were true it would be an irrelevant issue ! The key issue is whether patented drugs or Mother Nature's minerals and nutrients target cancer cells better. The fact of the matter is that chemotherapy does not target cancer cells. In fact, chemotherapy kills far, far more healthy cells than it does cancer cells. What this means is that chemotherapy must be given in very, very low doses, spread out over long periods of time, and the therapy must include gaps between the treatments. This "pacing" of the drugs is because too many healthy cells would be killed if too much chemotherapy were given too fast. The reason orthodox medicine treats cancer like a chronic disease is because orthodox treatments, in high doses, would kill the patient long before they would cure the cancer. This failure of orthodox medicine to safely kill cancer cells (i.e. safely target cancer cells) is why they talk about a "5 year cure rate" rather than a true cure rate. If they can keep the patient alive for 5 years they consider the patient to be "cured," even if they die in the sixth year. Mother Nature's cancer treatments, called natural cancer treatments, or more commonly "alternative cancer treatments," generally do absolutely no harm to healthy cells. This is because the human body, which was made by Mother Nature, knows exactly what to do with Mother Nature's minerals and nutrients. Virtually all natural treatments for cancer do not kill healthy cells - not a single one. This is the key - because alternative cancer treatments do not harm or kill healthy cells, the items from nature that can kill cancer cells can be given in much higher doses than chemotherapy - without any gaps in treatment!! Thus, even if the mutations of natural molecules, called drugs, were more potent at killing cancer cells than the original natural molecules, because of the superiority of natural substances at targeting cancer cells or leaving healthy cells healthy, alternative cancer treatments can be far more effective than orthodox drugs at treating cancer! Because Mother Nature does not necessarily condense the cancer-killing nutrients found in foods, some of the most potent of the alternative cancer treatments are liquid ionic minerals, certain types of ozone treatments, and other natural treatments that contain molecules that can be condensed, such as intravenous vitamin C (but not the Pauling/Cameron doses, however). Just how effective are the best treatments from Mother Nature ? Several alternative cancer treatments have achieved a consistent 50 % true cure rate on cancer patients who had been given up on by orthodox medicine and had been sent home to die! Such results are possible because these key alternative cancer treatments not only target cancer cells, they can be given in a very condensed and potent form, they do not need a catalyst, and they can be given safely in much higher doses than chemotherapy. Ponder that very carefully ! Also ponder the true cure rate of these same treatments on cancer patients who use these treatments exclusively, meaning they had not lost many months of treatment time while being treated with orthodox treatments ! However, do not assume every alternative cancer treatment is that effective. Very few of the 300+ alternative cancer treatments can come anywhere close to a 50% true cure rate on patients given up on by orthodox medicine. One of the big mistakes people who seek out alternative cancer treatments make is to assume that if an alternative cancer treatment will cure one patient, it will cure all cancer patients, no matter what condition they are in. This is a dangerous assumption because very, very few of the 300 + alternative cancer treatments are condensed and potent enough to cure 50 % of those sent home to die by orthodox medicine. Very few. There are very few minerals that can get inside of cancer cells. Two of the minerals that can get inside of cancer cells are cesium and potassium. Once cesium gets inside of cancer cells it starts to "pull" potassium from the blood into the cancer cells (potassium supplementation is required when on this treatment in order to replenish the potassium in the blood that was pulled into the cancer cells). When there is enough build-up of cesium and/or potassium inside the cancer cell, glucose is blocked from getting into the cancer cell. Since glucose is what feeds the cancer cell, the cancer cell will eventually die from starvation. Not only that, but cesium and/or potassium will also block the cancer cells from making lactic acid, meaning they block the cachexia cycle at the cancer cell. Other items also help block or overcome the cachexia cycle in different ways (e.g. hydrazine sulfate blocks the cachexia cycle at the liver). Dr. A. Keith Brewer, PhD, discovered in the 1980s how cesium can treat cancer. Aside from treating the cancer, it can treat the pain of cancer within 12 to 36 hours, depending on what is causing the pain. The liquid ionic cesium chloride used today is much more potent than the cesium carbonate of the 1980s. The complete protocol includes several other items. Like all of the most potent alternative cancer treatments, this treatment is so potent at killing cancer cells it must be "paced", meaning dosages must be set so the body has time to safely remove the debris caused by the dead cancer cells. Did you notice that orthodox cancer treatments must be "paced" because of all the healthy cells that they kill. But alternative cancer treatments must be "paced" because of all the targeted cancer cells they kill. Because of the number of cancer cells killed by the cesium chloride / DMSO treatment, the cancer patient needs the expert advice of a vendor who knows how to safely use these products. Fortunately, such experts exist. Also, these most potent treatments generally cannot be combined with each other (but they can be combined with some other alternative treatments). The doses for these products are designed to kill cancer cells at a rate that the body can safely handle the debris. To combine such treatments may create too high of a die-off rate. You probably believe that the true cure rate of orthodox cancer treatments is around 40 % and growing. This belief is the result of a wide variety of fancy statistical tricks. The fact is that if you get cancer, and you use nothing but orthodox cancer treatments, your chance of surviving your cancer (and surviving your cancer treatment) is only about 3%. On top of that, even the 3% who do survive have had their bodies so severely damaged that they are vulnerable to future bouts with cancer. Step 4) They send the patient home "in remission,"
This cycle continues until the patient is sent home to die (of course, they are sent home to die after one more round of chemotherapy and radiation). Soon the patient dies. This is the cycle for virtually all cancer patients. The only difference between one patient and another is how many times the cycle is repeated. One hundred years from now the medical doctors of the day will look at the "medicine" of today in total and absolute disgust. There is absolutely no excuse for what is going on today in medicine. Even those who stop this nonsense and go with alternative medicine have severe problems. Chemotherapy, radiation and surgery virtually destroy a person's immune system. A well put together natural treatment, on the other hand, which will actually include several different products which do different things, will actually build the person's immune system to make sure the cancer will not return. But alternative medicine cannot quickly mend an immune system that has been destroyed. That is why the most potent alternative cancer treatments do not take the time to fix the patient's immune system. The immune system is fixed during remission. First, ninety-five percent of cancer patients who go with alternative cancer treatments have already been given up for dead by orthodox medicine. In other words, they first went to orthodox medicine, their body was destroyed by orthodox medicine, THEN they decided to go with alternative cancer treatments. Second, because so few alternative cancer treatments can cure people sent home to die by orthodox medicine, very few of the cancer patients sent home to die pick a treatment strong enough to give them a fighting chance. In other words, very few of these cancer patients pick one of the most potent alternative cancer treatments. These two things create a severe disadvantage for alternative medicine. Alternative medicine has lost between 1 and 4 years to treat the patient and build their immune system - because the patient was using orthodox treatments. In addition to that, after orthodox treatments, the patient is in far worse physical and mental condition than they were when they were first diagnosed. This is why there are so few alternative cancer treatments that can achieve a true cure rate of 50% on these patients. 4) Of those who do go with alternative cancer treatments, only a very small percentage of them pick a treatment strong enough to give them a 50% chance of survival. Is it any wonder that deaths from cancer continue to rise in spite of the power of some of the alternative cancer treatments ? So, what is the cure rate of recently diagnosed cancer patients who go with alternative medicine exclusively? It depends on how dangerous their cancer is and what treatment they pick. There are more than 300 alternative cancer treatments. If they pick the best possible treatment for their situation, when they are first diagnosed, a 90% or higher true cure rate is fairly easy to achieve. Overall, there are at least two dozen alternative cancer treatments that can come close to a 90% overall true cure rate across the board for those who use alternative cancer treatments exclusively. The amazing thing is that orthodox medicine has had its own opportunities to have its own 90% cure rate. There are two incredible substances that allow chemotherapy to safely target cancer cells: insulin and DMSO. Insulin allows small amounts of chemotherapy to target cancer cells because of the way it works with the cell membranes. The treatment is called Insulin Potentiation Therapy (IPT). DMSO actually binds to small amounts of certain chemotherapy drugs. The DMSO, which has a very high affinity for cancer cells, then pulls the chemotherapy into the cancer cells with it. On this website, this treatment is called DMSO Potentiation Therapy (DPT). DPT and IPT are two treatments that are easy to combine. It is a very potent treatment. But don't ask your oncologist about it, he or she has probably never heard of it. Because these two treatments use very low doses of chemotherapy (about 1/10th a normal dose), and because the chemotherapy targets the cancer cells, these two treatments are very potent and have virtually no side-effects. But orthodox medicine does not use their own discoveries! They would rather have a 3 % cure rate than a 90 % cure rate ! So, if this is true, and it is true, why haven't you heard this on television a hundred times during your lifetime? Why don't movie stars, "investigative journalists", etc. constantly tout the vast superiority of alternative cancer treatments ? Everything you hear throughout your life is not based on who has the most truth, it is based on who has the most money. If you haven't figured that out by now, you better figure it out real quick. Fact #1) Virtually every American gets the vast majority of their information directly or indirectly from the media, which includes television, radio, newspapers, magazines, etc. Only the Internet, books and emails would not be considered part of the "media." Fact #2) The pharmaceutical industry spends $3 billion a year advertising in the media. Fact #3) In the 1940s, the book: The Drug Story was published by newspaper owner Morris Bealle. This book exposed the vast corruption in the media due to advertising dollars. In other words, it exposed why newspapers (this was before television) refused to tell the truth about corruption in corporations due to their fear of losing advertising dollars to these same corrupt corporations. However, it was well known long before the 1940s that advertising money bought influence with the media. Actually, this was known no later than the 1880s. In other words, for more than 100 years the media has clearly understood that if you say things in the media that are true, but cut into the profits of your advertisers, you will quickly lose not only your advertising revenue from that company, but possibly from many other companies as well (who also fear any type of honesty). Absolutely nothing has changed since the 1880s. Fact #4) As a result of the above item, and the $3 billion a year spent by the pharmaceutical industry in the media, American journalists are required to publicly be highly, highly loyal to the pharmaceutical industry. A single verbal slip by a journalist on or off the air could cost him or her their job. Prior approval by the advertisers is required to say anything mildly negative about the pharmaceutical industry. These same rules apply to most major industries, not just the pharmaceutical industry. Fact #5) The orthodox cancer treatments (e.g. surgery, chemotherapy, radiation and many others) used in "modern" medicine are equally subservient to the pharmaceutical industry. Actually, "modern" medicine was corrupt long before the pharmaceutical industry took over the medical schools many decades ago. Medical doctors, who are under the control of the American Medical Association, are not allowed to use any natural substance in the treatment of cancer. Modern "doctors" are taught nothing but medicine using prescription drugs. Medical doctors are only allowed to use natural substances in the treatment of the symptoms of prescription drugs. This is called "complementary alternative medicine" or CAM. CAM is not designed to treat any disease! Because of the money of the pharmaceutical industry: the medical community, the media and the politicians are all subservient to the pharmaceutical industry. All are in the same bed together. Fact #6) While vitamin companies can advertise in the media, the substances which are used in the most potent natural or alternative cancer treatments are never advertised in the media. Thus, the media receives $0 dollars of advertising related to viable alternative cancer treatments. Thus, there is a $3 billion dollar difference between what the pharmaceutical industry spends on advertising and what is spent for the main substances used in alternative cancer treatments. There is an equally proportional difference in the opinions you gather from watching or reading the media. Fact #7) Taking all of the above items into account, is it any wonder that the average American hears nothing good about alternative cancer treatments anywhere in the media, but hears hundreds or thousands of good things about orthodox medicine in the media every year (thousands if you include pharmaceutical advertisements). You might not remember hearing anything good about orthodox medicine. Every time you watch a role-playing show on television that glorifies a doctor or hospital you are being indoctrinated. Every time you hear a news program that implies you should go to your orthodox doctor for some problem, you are being indoctrinated. Every time you hear a pharmaceutical ad you are being indoctrinated. But you never hear anything positive about alternative cancer treatments. This is by design. Now you know why the government and the AMA don't want you to know the whole truth about your cancer treatment options. Now you know why medical doctors are not allowed to use natural substances in the treatment of cancer EVEN AFTER a person is sent home to die. Ponder that one carefully ! If alternative medicine is capable of having a consistent cure rate of 90 % or more, on newly diagnosed cancer patients, then clearly orthodox medicine is also capable of having a 90 % true cure rate on newly diagnosed cancer patients if doctors were allowed to use natural substances in the treatment of disease. That is exactly why they are not allowed to use alternative medicine to treat disease. The 3 % cure rate treatments are so much more profitable than the 90 % cure rate treatments, that the "leaders" of orthodox medicine have intentionally chosen to suppress the far superior alternative cancer treatments. If medical doctors were allowed to use alternative medicine on cancer patients they sent home to die, they could cure 50 % of them. That would lead to questions of why the alternative cancer treatment was not used first ! That is why medical doctors are not allowed to use alternative medicine even after the pharmaceutical industry and doctors already have their money and the patient is sent home to die ! This point is so important it cannot be made often enough. After orthodox medicine has all the money they can get from a cancer patient, the individual medical doctor is still not allowed to cure the patient with alternative medicine. This is the most telling fact of all in the battle between orthodox and alternative medicine. It would be too embarrassing to orthodox medicine for their cancer patients to be cured with alternative medicine after the orthodox treatments failed ! So to avoid the embarassment, they stand back and watch their patients die a painful death. While individual doctors may or may not know what is going on, and may or may not be at fault for what is going on, it is clear that the individual medical doctors can be severely criticized for not having the guts to clean house within the national and state AMA boards and stand up for their patient's health. They can also be severely criticized for not desiring to learn more about alternative cancer treatments. Most doctors don't want to "rock the boat". What you hear from the "cancer industry" and the media does not come from anyone who is concerned about your health (or your life), what you hear comes from people who care about their personal assets. What you hear is controlled very carefully by a wide network of cross-controlled organizations and advertising money. 1) Because of greed and corruption, orthodox medicine uses the most profitable treatments for cancer, thus their true cure rate is around 3 %. 2) The true cure rate of orthodox medicine could easily be 90 % or higher if they used the most effective orthodox cancer treatments or the most effective alternative cancer treatments. 3) Because of a wide variety of problems, but mainly because most cancer patients go with orthodox cancer treatments first, the true cure rate of alternative medicine is unknown, but it is probably around 10 % to 15 %. 4) Like orthodox medicine, the true cure rate of alternative cancer treatments could be 90 % or higher if newly diagnosed cancer patients went with alternative cancer treatments instead of orthodox cancer treatments and they found and used the most effective of the alternative cancer treatments for their situation. 5) Thus, orthodox medicine and alternative medicine have essentially the same potential, especially if orthodox medicine used the best of the alternative cancer treatments. But a medical doctor stands at risk of losing their medical license, and possibly going to jail, should they use the most effective cancer treatments, either orthodox or alternative. Thus, going with orthodox cancer treatments is almost always a mistake, because of the corruption in modern medicine. 6) Thus, for a newly diagnosed cancer patient, because they have the option to use alternative cancer treatments, and the freedom to do their homework on the Internet and in the right books, their only hope of achieving a high chance of survival is to use alternative cancer treatments. In short, the war between alternative cancer treatments and orthodox cancer treatments has nothing to do with science, it is a war of information and freedom. From a scientific standpoint, if the right treatment is chosen for a given situation, and the patient avoids orthodox medicine (except in rare situations), because of the corruption of orthodox medicine, alternative cancer treatments are far superior. But the side that wins the most cancer patients is the side with the most money. In other words, because they are corrupt. Pharmaceutical companies have the most money and the most influence over the media (who are essentially owned and controlled by the same people who own and control the pharmaceutical industry), thus almost all newly diagnosed cancer patients choose the worst possible option because the media has suppressed the truth, deceived them into thinking current orthodox medicine is wonderful and brainwashed them into picking their worst possible option. Medicine is not a "healing art," it is a business. Their goal is not to cure people, but to maximize their profits. Cancer is one of the key diseases that is a "goose that lays golden eggs" for orthodox medicine. No one wants to kill that goose. More than one million Americans die every year of cancer, heart disease, diabetes, etc., when they could have been cured or their disease could easily have been prevented. Instead of being told the truth, the truth is suppressed and replaced with false hopes, deceptive statistics and pressure. God will judge those who are responsible and God cannot be bribed. Across the jungles of India and Indonesia, a surprisingly practical tree called sapindus mukorrosi grows a small fruit surrounded by a firm outer shell, much like a lychee or rambutan. 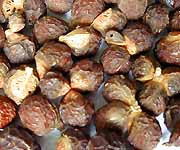 This tree, also called the Chinese Soapberry Tree, is unique in the fact that it synthesizes its own natural soap-like saponins that coat the shell of the fruit. When the fruits ripen and fall from the tree, local families harvest the windfall, then remove the inner fruit from the outer shell. The shell is then dried in the sun, using absolutely no chemical processing or manufacturing processes. In fact, the whole process uses no fossil fuels either, except in the transportation of the product to the western world (which is efficiently accomplished by ship). It is this outer shell - rich in natural saponins which act as water surfactants -that the native families in India have used for centuries to wash their own clothes. They toss 2-3 shells into a small burlap bag and work it in with their laundry (which is usually washed by hand, by the way). 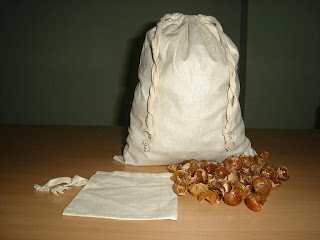 The soap nuts, as they're now called (even though they have no relation to actual nuts), absorb water and release their saponins which circulate as a natural surfactant in the wash water, reducing the surface tension of the water and freeing dirt, grime and oils from the clothing. 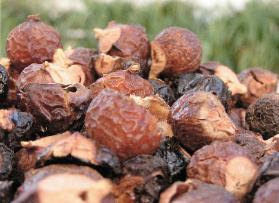 When the clothes are rinsed, the soap nut saponins are washed downstream where they remain harmless to the environment. No synthetic chemicals, no fragrance chemicals, no foaming agents or other toxins. Just nut shells grown by nature. Even though these soap nuts have been used for hundreds of years in India and Indonesia, they're barely known in the western world where brand-name chemical detergents are heavily marketed to consumers through advertising, coupons and in-store displays. Packed in eye-catching boxes and scented with artificial fragrance chemicals, these synthetic detergents are literally scooped up by tens of millions of consumers who have no idea they're bathing their clothes in cancer-causing chemicals while destroying the environment by flushing dangerous chemicals downstream. Until now, there have been few options for eco-conscious consumers. While an increasing number of eco-friendly manufactured laundry products now exist in the marketplace (such as Seventh Generation and Biokleen brands), no natural laundry product has appeared in the western world that is 100% manufactured directly by nature. And many of the so-called "natural" laundry products are still made with fragrance chemicals, anyway. When you purchase these soap nuts and put them to use, you're not only protecting your health and the environment, you're also supporting the families in India and Indonesia that sustainably harvest these nuts as a way of life. Remember how I'm always urging us all to "vote with our dollars?" This is the perfect opportunity to do so. Vote against the chemical laundry companies and vote FOR natural, tree-grown laundry products by switching to soap nuts ! This is the "miracle" laundry product made by Mother Nature that I've been looking for. It's made by a tree, with absolutely nothing added or taken away (except the fruit, of course). It's natural through and through. No other laundry product even comes close. Maggie's Soap Nuts replace both laundry detergent and fabric softener, by the way. They leave your clothes clean, unscented and feeling cozy soft. It's the first laundry product I've ever found that I was truly happy with. This is what I'm now washing all my clothes with. But do the soap nuts really work ? Of course, any skeptical consumer would be asking one question right now : "Do these soap nuts really work ?" I was skeptical, too, that a soap nut grown by a tree in India could really replace my high-tech eco-friendly laundry soap made in America. So I bought a box of Maggie's Soap Nuts and tried them myself. I took 3 soap nuts and dropped them into the small cotton bag that comes in each box of Maggie's Soap Nuts, then I tossed them into my laundry and avoided using any other detergents or laundry products. I set the temperature on warm and gave it a normal wash cycle, then I hit the start button and walked away. An hour later, I returned and examined the finished load. They sure smelled clean. But the real test would come from wearing them during a workout, so I took them outside to dry them in the sun (since we have such great sunlight here in Arizona, I often use it for drying clothes). After a few hours of blazing desert sunlight, the clothes were completely dry. I suited up with a pair of workout pants and an A shirt, then headed to the gym for an intense workout designed to produce lots of sweat. The short version of this story is that the clothes were really, truly clean and they smelled just fine, even after an hour of sweat-inducing cardiovascular activity. (It also helps that I don't drink dairy products, which makes people stink, but that's another story...) My workout clothes seemed just as clean to me as any other load of laundry I washed in various eco-friendly laundry products! Over the next few days, I continued washing more loads with the soap nuts. Every load came out clean, yet unscented (just the way I like it). I washed grimy socks, workout pants, hiking shorts and sweaty underwear, and everything was cleaned to my satisfaction. In other words, Maggie's Soap Nuts really clean your clothes just as good as commercial soap products! I remain convinced that these tree-grown soap nuts are just as good as any other soap products on the market. One thing I did learn in all this, however, was that you probably shouldn't wash bedsheets with these soap nuts. What happened? In my wash, the small cotton bag holding the soap nuts got wrapped up in the sheet, and the soap nuts soaked the sheet with a slight soap nut color (sort of rust colored). This color came out in the next wash, because it's not a permanent stain or anything, but it taught me that for the soap nuts to be really effective, they needed to be able to circulate freely in the laundry and not get caught in a large bedsheet. Aside from the bedsheet incident, everything else came out of the wash sqeaky clean ! How soap nuts clean your laundry ? The process by which soap nuts clean your clothes is naturally quite simple. The soap nut shell contains a natural saponin that works as a surfactant, making your water "wetter" and allowing it to penetrate the fibers of your clothing, working away the dirt and grime that makes clothes dirty. The surfactant then holds on to the dirt, keeping it in suspension in the water until it's drained away, taking the dirt with it. What's left is a load of clean clothes and nothing else! That's the way laundry should be. Much like clean water, clean laundry should NOT contain toxic chemical residues. In fact, it's more important to consider what laundry products do NOT contain than to look at what they do contain. • Fragrance chemicals that make laundry "smell" clean. Most commercial laundry products use toxic, synthetic fragrance chemicals that are, in fact, well known to promote cancer and liver disorders. Laundry products are not really regulated by any single government agency, and there is currently no law banning the use of known cancer-causing chemicals in laundry products (much like with cosmetics). • Filler ingredients. Nearly all commercial laundry products are made with at least 50% filler ingredients to "bulk them up" and make them appear to deliver more value for the price. Consumers are mostly just buying the illusion of detergent, made mostly with filler. You won't find filler or toxic chemicals in Maggie's Soap Nuts. Just pure, natural saponins grown by a tree and engineered by nature. In my opinion, that's where more of our products should ultimately come from. Wouldn't it be great if shampoo also grew on trees? The natural saponins found in Maggie's Soap Nuts are universal cleaning agents. Sure, they work great in the laundry, but did you know they are also traditionally used to clean skin and hair? 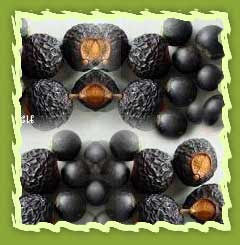 In fact, the soap nut saponins work on everything from pets and children to washing fruits and vegetables. In ancient India, jewelers even used the soap to shine their precious metals and stones, giving them a beautiful natural luster. By the way, all children's clothes should be washed in these soap nuts to avoid exposing infants and children to the toxic chemicals found in commercial laundry products. And while you're at it, why not save yourself from that exposure, too, by washing your own clothes with nature's laundry soap? Using Maggie's Soap Nuts, you can make your own ultra-pure multipurpose cleaner. Simmer 1 cup of soap nuts in 4 cups of water on your stove, then allow the liquid to cool. Mash the soap nuts by hand (squish them around to get out all the saponins), then drain the resulting liquid through a cheese cloth or nut milk bag. Voila! You've got a concentrated cleaner made by nature! Use it around the kitchen, in the shower, washing the dog... it's all good. You can even use it to wash your dishes. Remember : This natural soap isn't going to foam up like phoney cleaning products made by chemical companies, and it sure doesn't smell like fragrance chemicals. So don't expect it to look or smell like the products you might have been using. However, soap nuts get things really clean. The soap works so well that it's actually being studied right now as a way to decontaminate soils from exposure to toxic chemicals. How's that for a natural solution? Nature's soap can save the planet from man's soap. Overall, I'm incredibly delighted to have discovered Maggie's Soap Nuts. They're nature's gift to the world, and we would all be smart to stop buying manufactured laundry detergents and switch to natural laundry soaps that grow on trees. It's good for your health, your family and your environment. Plus, it ends the cycle of monetary support for manipulative consumer product companies that poison the world with their harmful chemicals products. All those brightly-colored laundry detergent boxes lining the shelves of your local grocery store are, indeed, quite poisonous to both you and the planet. How much do soap nuts cost ? The price of using these soap nuts in your laundry is well under fifty cents a load (U.S.), making it quite comparable to other eco-friendly laundry products. It's not as cheap as dumping foaming chemicals into your laundry, but then again, if you're the kind of person reading this website, you're probably far more concerned about saving your health than saving a quarter on a load of toxic laundry. Isn't it good to know that you can protect your health and protect the planet as the same time ? Washing your clothes doesn't have to be bad for the environment. There's a new option now in the western world : Soap nuts ! This is an extract from Newstarget.com for your knowledge today. As a culture, we accept, tolerate, advocate, and make laws that promote the unlawful murder of thousands of infants because we have a belief system, and a public policy, that allows these children to be the “necessary” sacrifices of what is believed to be an unassailable system of vaccinations. The purpose of murdering perhaps several thousand infants per year is because we think that the good of the vaccine policy helps other children live and thus supposedly outweighs the known harm caused. Now, I am going to bring up a critical example to show you the error of the current vaccine paradigm that allows for children to be harmed. Imagine that one of these children was your own. Or, imagine that one of these individuals was your mother, your sister or brother, or a saint. Are you telling me that one of the greatest examples of the cruelties of humanity, sacrificing helpless infants, is justifiable to supposedly save others? Is it really good public policy to crucify some children to supposedly prevent diseases in others? If it was your child, would you volunteer your child to be the sacrificial lamb of our public policy ? Do not volunteer your child anymore and allow them to be the next lamb of our hideous public policy, do not vaccinate your child ! The truth is, every child's and every infant's life is valuable. Each being is precious, full of life and warmth, each infant is god-like. Every person on this planet counts and deserves the chance to live a healthy life. Since we have a public policy that allows for innocent children to be harmed, and at times murdered, then this policy must stop immediately. We know for sure that at least 70 or more children are murdered yearly, and more likely several thousand children are murdered every year. When any individual or government sponsors vaccines; this is the equivalent to sponsoring the crime of murder. This is an outrage! This first argument against vaccinations has come to you allowing the broad assumption that vaccines work, and that the losses of human life are thus justifiable because many more lives are supposed to be saved by vaccine public policy. In simple English, we have no real, double blind scientific studies that show that any vaccination works as it is intended to work. In case you are wondering, normal vaccines are approved for use with only short-term studies, many times the studies are 30 days or less. It is hardly scientific to study the effects of vaccines for such a short term, when vaccines are designed to work for several years at a time. Thus, the long term effects, and the long term effectiveness of vaccines, have never been proven; let alone reasonably studied by the people who unconditionally believe in their good. Because “Safety testing of many vaccines is limited and the data are unavailable for independent scrutiny”; in the year 2000, the Association of American Physicians and Surgeons passed a resolution calling for a moratorium on vaccine mandates. With such limited evidence, they stated that mandatory vaccination “is equivalent to human experimentation.” Unethical human experimentation was banned by the Nuremberg Code after the horrors of World War II were exposed (Nazi experiments on their prisoners). Not only do vaccines not work, they actually cause diseases. According to the same US government Vaccine Adverse Events Reporting System, there were approximately 1400 serious events from vaccinations for people of all ages, per year, from 1991-1996. Serious events include: permanent disability, hospitalization, and life threatening illnesses. And we can know for sure, due to the low reporting of serious vaccine events, that the actual number of diseases caused by vaccinations is 10 - 100 times this number, meaning vaccines cause 14,000 - 140,000 serious events (diseases) per year. In some cases, such as with the Hepatitis B vaccine given to infants and children, the vaccine causes more harm and injury that the disease of Hepatitis B in infants and children. Published studies from reputable journals have linked vaccines to causing AIDS, autism, cancer, diabetes, hearing/vision loss, hepatitis B, mumps, measles, polio and rubella. At this point you might be wondering how it is that vaccines can cause so much destruction. Why Vaccines Cause Diseases ? Our body is equipped with an immune system. The immune system I am referring to is not just helper cells and anti-bodies, we have several lines of defense against infection and illness. We have saliva that is full of germs, and we have skin to protect our organs. We have a liver and kidneys to cleanse our blood and excrete toxic waste. We have our lungs to take in fuel, and excrete the waste of cellular metabolism. In order to make a vaccine, one needs to render the virus, or germ, ineffective and find a way to introduce it into the body. In order to make many batches of this virus for injection, the virus needs food to grow off of. To grow a vaccine virus, the virus is cultured on a variety of nutrient rich substances; like monkey kidney cells, aborted human fetuses, calf serum, guinea pig embryonic tissue, fetal tissue, and other foul things. Once you have this large batch of “disease,” and you can imagine how sick and putrid this mix is, you need to remove all the impurities and isolate the virus (or germ) that you want to inject into someone. Now isolating just the virus from this milieu is impossible. Yet we try anyway, we bleach and cleanse the serum and get mostly the virus, plus many contaminants. Now, when the body gets injected with this virus, it will immediately seek to repel it, especially since it is rare for a disease to be introduced into the body directly through the blood stream. Vaccine creators had to find ways to keep the altered virus or germ from being immediately repelled from the body, and this is one purpose of adjuvants, vaccine additives. Every vaccine contains MSG as one such additive; other vaccine additives include, thimerosal which is mercury, antibiotics, anti-freeze and other poisonous and acidic compounds. Now imagine your helpless infant. They hardly have an immune system as their bodies' lines of defenses. Their organs are still growing and forming. It is our public policy to inject infants soon after birth, directly with a syringe full of foreign substances. The injection dosage is not carefully measured to be specific to the exact body weight of the infant, and the dose has never been independently screened to be free of contaminants. Immediately after the injection, the body goes into life saving procedures. If you have a healthy and robust child, you will be lucky to get away with a cold or flu-like symptoms, as your child's body tries to excrete all of the impurities just injected through its organs of purification: such as the kidney's, the liver, and the skin. If you have a less robust child, their body's defense mechanisms can fail one after the next, especially after repeated injections. When the body's internal purifiers fail, the blood-brain barrier becomes compromised; that is why a known side effect to vaccines is a high-pitched screaming. The screaming is the nervous system of an infant being damaged and breached as it was never meant to be. Many children are autistic because of vaccinations as the toxic poisons in the vaccines get lodged into places that can alter and affect the nervous system; including brain and spinal column development. Dr. Albert Sabien, developer of the oral polio vaccine, has changed his vaccine position widely. In a 1995 lecture, he said, "Official data have shown that the large-scale vaccinations undertaken in the US have failed to obtain any significant improvement of the diseases against which they were supposed to provide protection." With this in mind, we have before us one of the most horrific, disturbing, and incompressible crimes ever committed. Each and every day, thousands of parents along with local and state governments, schools, doctors and politicians, allow this crime, and even promote this crime, as it continues to go unnoticed by the masses. Let me add one final note to this article. You may have heard of these supposedly great humanitarian organizations going into the third world and providing community service by vaccinating poor children against diseases. Given your new awareness about the lack of evidence of vaccine efficacy, you might wonder what these organizations are really doing? This is what the World Health Organization asked themselves in an internal review, after noticing that an AIDS epidemic seemed to follow where they were vaccinating. You need to know why you have been led so far from the path of truth. You need to know that when you see media reports that promote the good of vaccines and their effectiveness, such as news or television reports, that these reports are completely fake and fabricated. This leads me to the conclusion that some of the most powerful forces are at play, since they can easily and freely put manipulative and false material into the public's eye. Healthy children come from healthy parents who eat whole and unrefined organic foods, who avoid processed foods like pasteurized milk, processed sugar, cheap vegetable oils, infant formulas, and processed flour products that are so prevalent in our food supply. If you want your child to be healthy and disease free, do not give them a polluted body. Do not violate the purity of your child's blood. Loving our children means not giving them vaccinations and it means that we need to inform other parents as well that vaccines are indeed shown and proven to be deadly. Spread the word and do your part in ending this heinous crime. “The greatest lie ever told is that vaccines are safe and effective,” and now you know why. May you and your children experience peace and happiness beyond vaccines. Below is an extract from MedicineNet.Com for everyone's information. Lupus is a sickness which is on the increase in our society today. Seek medical attention immediately, when any of the said signs & symptoms arise. Lupus is a condition characterized by chronic inflammation of body tissues caused by autoimmune disease. Autoimmune diseases are illnesses that occur when the body's tissues are attacked by its own immune system. The immune system is a complex system within the body that is designed to fight infectious agents, for example, bacteria, and other foreign invaders. One of the mechanisms that the immune system uses to fight infections is the production of antibodies. Patients with lupus produce abnormal antibodies in their blood that target tissues within their own body rather than foreign infectious agents. Because the antibodies and accompanying cells of inflammation can involve tissues anywhere in the body, lupus has the potential to affect a variety of areas of the body. Sometimes lupus can cause disease of the skin, heart, lungs, kidneys, joints, and/or nervous system. When only the skin is involved, the condition is called discoid lupus. When internal organs are involved, the condition is called systemic lupus erythematosus (SLE). Both discoid and systemic lupus are more common in women than men (about eight times more common). The disease can affect all ages but most commonly begins from age 20 to 45 years. It is more frequent in African-Americans and people of Chinese and Japanese descent. What causes lupus ? Is it hereditary ? The precise reason for the abnormal autoimmunity that causes lupus is not known. Inherited genes, viruses, ultraviolet light, and drugs may all play some role. Genetic factors increase the tendency of developing autoimmune diseases, and autoimmune diseases such as lupus, rheumatoid arthritis, and immune thyroid disorders are more common among relatives of patients with lupus than the general population. Some scientists believe that the immune system in lupus is more easily stimulated by external factors like viruses or ultraviolet light. Sometimes, symptoms of lupus can be precipitated or aggravated by only a brief period of sun exposure. It also is known that some women with SLE can experience worsening of their symptoms prior to their menstrual periods. This phenomenon, together with the female predominance of SLE, suggest that female hormones play an important role in the expression of SLE. This hormonal relationship is an active area of ongoing study by scientists. More recently, research has demonstrated evidence that a key enzyme's failure to dispose of dying cells may contribute the development of SLE. The enzyme, DNase1, normally eliminates what is called "garbage DNA" and other cellular debris by chopping them into tiny fragments for easier disposal. The researchers turned off the DNase1 gene in mice. The mice appeared healthy at birth but after six to eight months, the majority of mice without DNase1 showed signs of SLE. Thus, a genetic mutation in a gene that could disrupt the body's cellular waste disposal may be involved in the initiation of SLE. What is drug-induced lupus ? Dozens of medications have been reported to trigger SLE; however, more than 90% of this "drug-induced lupus" occurs as a side effect of one of the following six drugs: hydralazine (used for high blood pressure), quinidine and procainamide (used for abnormal heart rhythm), phenytoin (used for epilepsy), isoniazid [(Nydrazid, Laniazid), used for tuberculosis], d-penicillamine (used for rheumatoid arthritis). These drugs are known to stimulate the immune system and cause SLE. Fortunately, drug-induced SLE is infrequent (accounting for less than 5% of SLE among all patients with SLE) and usually resolves when the medications are discontinued. What are the symptoms and signs of lupus? In discoid lupus, only the skin is typically involved. The skin rash in discoid lupus often is found on the face and scalp. It usually is red and may have raised borders. Discoid lupus rashes are usually painless and do not itch, but scarring can cause permanent hair loss. Over time, 5%-10% of patients with discoid lupus may develop SLE. Patients with SLE can develop different combinations of symptoms and organ involvement. Common complaints and symptoms include fatigue, low-grade fever, loss of appetite, muscle aches, arthritis, ulcers of the mouth and nose, facial rash ("butterfly rash"), unusual sensitivity to sunlight (photosensitivity), inflammation of the lining that surrounds the lung (pleuritis) and the heart (pericarditis), and poor circulation to the fingers and toes with cold exposure (Raynaud's phenomenon). More serious organ involvement with inflammation occurs in the brain, liver, and kidney. White blood cells and blood clotting factors also can be decreased in SLE, thereby increasing the risk of infection and bleeding. 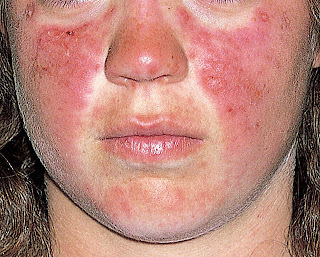 Over half of the patients with SLE develop a characteristic red, flat facial rash over the bridge of their nose. Because of its shape, it is frequently referred to as the "butterfly rash" of SLE. The rash is painless and does not itch. The facial rash, along with inflammation in other organs, can be precipitated or worsened by exposure to sunlight, a condition called photosensitivity. This photosensitivity can be accompanied by worsening of inflammation throughout the body, called a "flare" of disease. Inflammation of blood vessels, (vasculitis) that supply oxygen to tissues, can cause isolated injury to a nerve, the skin, or an internal organ. The blood vessels are composed of arteries that pass oxygen-rich blood to the tissues of the body and veins which return oxygen-depleted blood from the tissues to the lungs. 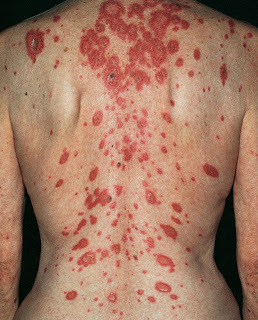 Vasculitis is characterized by inflammation with damage to the walls of various blood vessels. The damage blocks the circulation of blood through the vessels and can cause injury to the tissues that the vessels supply. Inflammation of the lining of the lungs (pleuritis) and of the heart (pericarditis) can cause sharp chest pain. The chest pain is aggravated by coughing, deep breathing, and certain changes in body position. The heart muscle itself rarely can become inflamed (carditis). It has also been shown that young women with SLE have a significantly increased risk of heart attacks from coronary artery disease. Kidney inflammation in SLE can cause leakage of protein into the urine, fluid retention, high blood pressure, and even kidney failure. With kidney failure, machines are needed to cleanse the blood of accumulated poisons in a process called dialysis. Involvement of the brain can cause personality changes, thought disorders (psychosis), seizures, and even coma. Damage to nerves can cause numbness, tingling, and weakness of the involved body parts or extremities. Brain involvement is called cerebritis. Many patients with SLE experience hair loss (alopecia). Often, this occurs simultaneously with an increase in the activity of their disease. Some patients with SLE have Raynaud's phenomenon. In these patients, the blood supply to the fingers and toes becomes interrupted upon exposure to cold, causing blanching, bluish discoloration, and pain in the exposed fingers and toes. 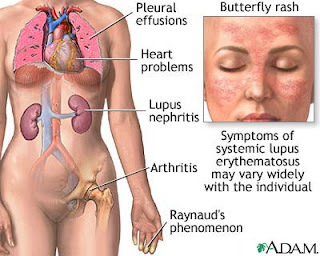 What are the symptoms and signs of lupus ? How is lupus diagnosed ? Since patients with SLE can have a wide variety of symptoms and different combinations of organ involvement, no single test establishes the diagnosis of systemic lupus. To help doctors improve the accuracy of the diagnosis of SLE, eleven criteria were established by the American Rheumatism Association. These 11 criteria are closely related to the symptoms discussed above. Some patients suspected of having SLE may never develop enough criteria for a definite diagnosis. Other patients accumulate enough criteria only after months or years of observation. When a person has four or more of these criteria, the diagnosis of SLE is strongly suggested. Nevertheless, the diagnosis of SLE may be made in some settings in patients with only a few of these classical criteria. Of these patients, a number may later develop other criteria, but many never do. In addition to the 11 criteria, other tests can be helpful in evaluating patients with SLE to determine the severity of organ involvement. These include routine testing of the blood to detect inflammation (for example, a test called the sedimentation rate), blood chemistry testing, direct analysis of internal body fluids, and tissue biopsies. Abnormalities in body fluids and tissue samples (kidney, skin, and nerve biopsies) can further support the diagnosis of SLE. The appropriate test procedures are selected for the patient individually by the doctor. What is the treatment for systemic lupus ? There is no permanent cure for SLE. The goal of treatment is to relieve symptoms and protect organs by decreasing inflammation and/or the level of autoimmune activity in the body. Many patients with mild symptoms may need no treatment or only intermittent courses of antiinflammatory medications. Those with more serious illness involving damage to internal organ(s) may require high doses of corticosteroids in combination with other medications that suppress the body's immune system. Patients with SLE need more rest during periods of active disease. Researchers have reported that poor sleep quality was a significant factor in developing fatigue in patients with SLE. These reports emphasize the importance for patients and physicians to address sleep quality and the effect of underlying depression, lack of exercise, and self-care coping strategies on overall health. During these periods, carefully prescribed exercise is still important to maintain muscle tone and range of motion in the joints. Nonsteroidal antiinflammatory drugs (NSAIDs) are helpful in reducing inflammation and pain in muscles, joints, and other tissues. Examples of NSAIDs include aspirin, ibuprofen (Motrin), naproxen (Naprosyn), and sulindac (Clinoril). Since the individual response to NSAIDs varies among patients, it is common for a doctor to try different NSAIDs to find the most effective one with the fewest side effects. The most common side effects are stomach upset, abdominal pain, ulcers, and even ulcer bleeding. NSAIDs are usually taken with food to reduce side effects. Sometimes, medications that prevent ulcers while taking NSAIDs, such as misoprostol (Cytotec), are given simultaneously. Corticosteroids are more potent than NSAIDs in reducing inflammation and restoring function when the disease is active. Corticosteroids are particularly helpful when internal organs are involved. Corticosteroids can be given by mouth, injected directly into the joints and other tissues, or administered intravenously. Unfortunately, corticosteroids have serious side effects when given in high doses over prolonged periods, and the doctor will try to monitor the activity of the disease in order to use the lowest doses that are safe. Side effects of corticosteroids include weight gain, thinning of the bones and skin, infection, diabetes, facial puffiness, cataracts, and death (necrosis) of large joints. Hydroxychloroquine (Plaquenil) is an antimalarial medication found to be particularly effective for SLE patients with fatigue, skin, and joint disease. Side effects include diarrhea, upset stomach, and eye pigment changes. Eye pigment changes are rare, but require monitoring by an ophthalmologist (eye specialist) during treatment with Plaquenil. Researchers have found that Plaquenil significantly decreased the frequency of abnormal blood clots in patients with systemic SLE. Moreover, the effect seemed independent of immune suppression, implying that Plaquenil can directly act to prevent the blood clots. This fascinating work highlights an important reason for patients and doctors to consider Plaquenil, especially for those SLE patients who are at some risk for blood clots in veins and arteries, such as those with phospholipid antibodies (cardiolipin antibodies, lupus anticoagulant, and false positive VDRL). This means not only that Plaquenil reduces the chance for reflares of SLE, but it can also be beneficial in 'thinning' the blood to prevent abnormal excessive blood clotting. For resistant skin disease, other antimalarial drugs, such as chloroquine (Aralen) or quinacrine, are considered, and can be used in combination with hydroxychloroquine. Alternative medications for skin disease include dapsone and retinoic acid (Retin-A). Retin-A is often effective for an uncommon wart-like form of lupus skin disease. For more severe skin disease, immunosuppressive medications are considered as below. Medications that suppress immunity (immunosuppressive medications) are also called cytotoxic drugs. Immunosuppressive medications are used for treating patients with more severe manifestations of SLE with damage to internal organ(s). Examples of immunosuppressive medications include methotrexate (Rheumatrex, Trexall), azathioprine (Imuran), cyclophosphamide (Cytoxan), chlorambucil (Leukeran), and cyclosporine (Sandimmune). All immunosuppressive medications can seriously depress blood cell counts and increase risks of infection and bleeding. Other side effects are peculiar for each drug. For examples, Rheumatrex can cause liver toxicity, while Sandimmune can impair kidney function. In recent years, mycophenolate mofetil (Cellcept) has been used as an effective medication for lupus, particularly when it associated with kidney disease. Cellcept has been helpful in reversing active lupus kidney disease (lupus renal disease) and in maintaining remission after it is established. It's lower side effect profile has advantage over traditional immune suppression medications. In SLE patients with serious brain or kidney disease, plasmapheresis is sometimes used to remove antibodies and other immune substances from the blood to suppress immunity. Some SLE patients can develop seriously low platelet levels, thereby increasing the risk of excessive and spontaneous bleeding. Since the spleen is believed to be the major site of platelet destruction, surgical removal of the spleen is sometimes performed to improve platelet levels. Other treatments have included plasmapheresis and the use of male hormones. Plasmapheresis has also been used to remove proteins (cryoglobulins) that can lead to vasculitis. Endstage kidney damage from SLE requires dialysis and/or a kidney transplant. Most recent research is indicating benefits of rituximab (Rituxan) in treating lupus. Rituximab is an intravenously infused antibody that suppresses a particular white blood cell, the B cell, by decreasing their number in the circulation. B cells have been found to play a central role in lupus activity, and when they are suppressed, the disease tends toward remission. At the 2007 national Rheumatology meeting, there was a paper presented suggesting that low dose dietary supplementation with omega-3 fish oils could help patients with lupus by decreasing disease activity and possibly decreasing heart disease risk. How can a lupus patient help prevent disease activity (flares) ? SLE is undoubtedly a potentially serious illness with involvement of numerous organ systems. However, it is important to recognize that most patients with SLE lead full, active, healthy lives. Periodic increases in disease activity (flares) can usually be managed by varying medications. Since ultraviolet light can precipitate and worsen flares, patients with systemic lupus should avoid sun exposure. Sunscreens and clothing covering the extremities can be helpful. Abruptly stopping medications, especially corticosteroids, can also cause flares and should be avoided. Patients with SLE are at increased risk of infections, especially if they are taking corticosteroids or immunosuppressive medications. Therefore, any unexpected fever should be reported and evaluated. The key to successful management of SLE is regular contact and communication with the doctor, allowing monitoring of symptoms, disease activities, and treatment side effects. How can lupus affect pregnancy or the newborn ? Patients with SLE who become pregnant are considered "high risk." Women with SLE who are pregnant require close observation during pregnancy and delivery. This includes fetal monitoring by the obstetrician during later pregnancy. These women can have an increased risk of miscarriages (spontaneous abortions) and can have flares of SLE during pregnancy. The presence of phospholipid antibodies, such as cardiolipin antibodies or lupus anticoagulant, in the blood can identify patients at risk for miscarriages. Cardiolipin antibodies are associated with a tendency toward blood clotting. Patients with SLE who have cardiolipin antibodies or lupus anticoagulant may need blood thinning medications (aspirin with or without heparin) during pregnancy to prevent miscarriages. Other reported treatments include the use of intravenous gamma globulin for selected patients with histories of premature miscarriage and those with low blood-clotting elements (platelets) during pregnancy. Pregnant women who have had a previous blood clotting event may benefit by continuation of blood thinning throughout and after pregnancy for up to six to 12 weeks, at which time the risk of clotting associated with pregnancy seems to diminish. Plaquenil has now been found to be safe for use to treat SLE during pregnancy. Lupus antibodies can be transferred from the mother to the fetus and result in lupus illness in the newborn ("neonatal lupus"). This includes the development of low red cell (anemia) and/or white blood cell and platelet counts, and skin rash. Problems can also develop in the electrical system of the baby's heart (congenital heart block). Occasionally, a pacemaker for the baby's heart is needed in this setting. Neonatal lupus and congenital heart block are more common in newborns of mothers with SLE who carry antibodies referred to as anti-Ro (or SS-A) and anti-La (or SS-B). (It is wise for the newborn baby's doctor to be made aware if the mother is known to carry these antibodies. Risk of heart block is 2%, risk of neonatal lupus is 5%.) Neonatal lupus usually clears after six months of age as the mother's antibodies are slowly metabolized by the baby. What does the future hold for patients with lupus ? Overall, the outlook for patients with systemic lupus is improving each decade with the development of more accurate monitoring tests and treatments. The role of the immune system in causing diseases is becoming better understood through research. This knowledge will be applied to design safer and more effective treatment methods. For example, completely revising the immune system of patients with extremely aggressive treatments that virtually temporarily wipe out the immune system is being evaluated. Current studies involve immune eradication with or without replacement of cells that can re-establish the immune system (stem cell transplantation). It should be noted that patients with SLE are at a somewhat increased risk for developing cancer. The cancer risk is most dramatic for blood cancers, such as leukemia and lymphoma, but is also increased for breast cancer. This risk probably relates, in part, to the altered immune system that is characteristic of SLE. Women with SLE appear to be at increased risk for heart disease (coronary artery disease) according to recent reports. Women with SLE should be evaluated to minimize risk factors for heart disease, such as elevated blood cholesterol, quitting smoking, high blood pressure, and obesity. DHEA (dehydroepiandrosterone) has been helpful in reducing fatigue, improving thinking difficulties, and improving quality of life in patients with SLE. Recent research indicates that DHEA has been shown to improve or stabilize signs and symptoms of SLE. DHEA is commonly available in health food stores, pharmacies, and many groceries. Landmark research has shown clearly that oral contraceptives do not increase the rate of flares of systemic lupus erythematosus. This important finding is opposite to what has been thought for years. Now we can reassure women with lupus that if they take birth control pills, they are not increasing their risk for lupus flares. NOTE: Birth control pills or any estrogen medications still should be avoided by women who are at increased risk of blood clotting, such as lupus women who have phospholipid antibodies (including cardiolipin antibody or lupus anticoagulant). Individuals with SLE can improve their prognosis by learning about the many aspects of the illness as well as closely monitoring their own health with their doctors.